(“Frank Stella: Paintings, Leo Castelli Gallery 4 East 77th Street, New York NY NY April 28 – May 19  Opening All Day”). 1962. Lithograph on die-cut paper printed in metallic ink (copper) on both sides. 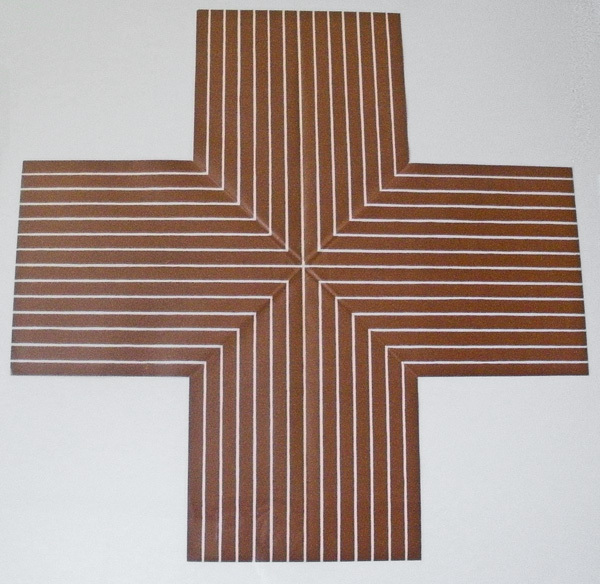 17 ¾ x 17 ¾”. Conceived by the artist, this shaped exhibition poster commemorates Stella’s seminal, second one-person show at Leo Castelli Gallery. A condensation of Stella’s first two shows is presently re-gathered at L & M Arts, New York, the importance of which is described by Roberta Smith: “These works (from 1960 and 1962) represent the cornerstone of Mr. Stella’s reputation, the Stella whose historical importance, as with Picasso’s Cubist paintings, is most widely, if somewhat predictably, accepted…They hark back to a time when flatness was abstract painting’s primary goal, and the physical facts of the medium were starting to be endlessly parsed—beginning with shaped canvases—in a process that continues today. No artist’s work embodied these pursuits as rigorously as Mr. Stella’s; in the paintings at L & M, he laid down the tracks that others followed” (Roberta Smith, The New York Times, April 26, 2012). 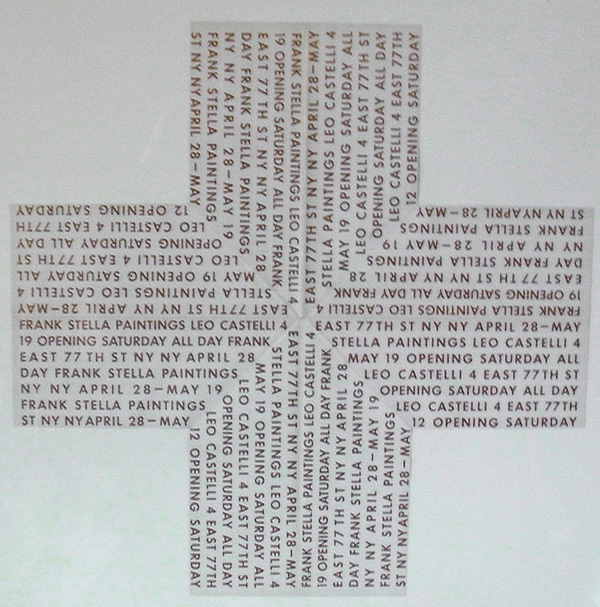 This elaborately conceived announcement published by Leo Castelli is shaped and inked in the manner of the artist’s canvases, and at this point, is arguably more difficult to come by than one of the artist’s notoriously rare Aluminum or Copper paintings. Very rare. In mint condition with no visible time staining. 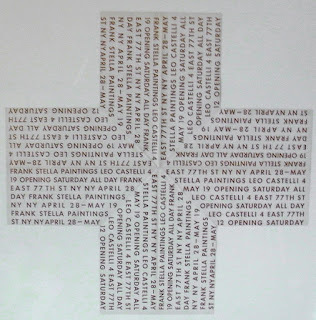 Take note of the back story: the unfolding, typographic lay-out on the verso of the 1962 announcement echoes Stella’s typographic, shape-shifting rhetoric operative in the paintings: when folded, the announcement forms the shape of an “L” (when opened, it otherwise forms the shape of a “T” or a crucifix). This linguistic transition—and ability to shapeshift--mirrors the transmogrification of Stella’s series of Aluminum and Copper paintings included in the 1962 show itself, many of which are shaped like alphabetic letters or as here, a cross. In other words, the concept / form / design of this early, Castelli-published offering functions just as the system of objects that it announces. If not the holy grail, certainly the “cornerstone” foundation of both Stella’s work and early commitment to print.